Legislative leaders report on discussions of the state budget deficit in December. 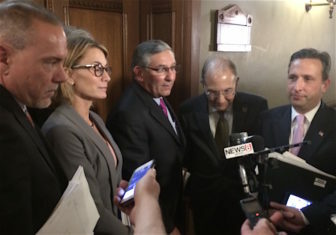 From left, House Majority Leader Joe Aresimowicz, House Minority Leader Themis Klarides, Senate Minority Leader Len Fasano, Senate President Pro Tem Martin Looney and Senate Majority Leader Bob Duff. Eroding state income tax receipts have largely undone Gov. Dannel P. Malloy and the legislature’s efforts to whittle down big budget deficits projected for each of the next three fiscal years, a new report showed late Friday. The consensus revenue forecast issued by nonpartisan analysts and by the administration also shows state finances are back in the red this fiscal year — albeit by a fraction of a percentage — just six weeks after an earlier deficit was wiped out. The state income tax, which was projected to bring in more than $9.8 billion this year back when the budget was adopted in June, now is expected to yield $260 million less. Expectations for the state’s largest revenue source also were scaled back for the next three years, when Connecticut faces increasing deficit projections. And $215 million for 2018-19. And while sales and corporation tax revenues grew enough to offset much of the income tax erosion this year, projections for sales and corporation tax receipts for the next three years did not change significantly. The legislature’s nonpartisan Office of Fiscal Analysis first reported major deficits in upcoming state budgets in mid-November when they issued their Fiscal Accountability Report, an omnibus annual projection of spending, revenue and other budgetary trends. At that time, OFA projected a 3 percent hole in the general fund for 2016-17, equal to $552 million. Much more imposing gaps of $1.72 billion for 2017-18 — the first new budget after the next state election — and $1.87 billion for 2018-19, were projected at the same time. And those forecasts also were driven largely by sharp corrections in previously projected growth for state income tax receipts. After Malloy and his fellow Democrats in the legislature’s majority agreed in special session in December to a modest array of spending cuts — largely to close a $300 million-plus hole in the current year and restore funding for hospitals — analysts also agreed that this had whittled about $200 million off the deficits in the years to come. But once the new revenue downgrades are factored in, the red ink swells once more, pushing the shortfall Malloy and legislators face in 2016-17 back over $500 million. And they must begin solving that problem in less than three weeks. The governor’s proposed adjustments to the 2016-17 budget are due to lawmakers on the opening day of the regular 2016 session on Feb. 3. The much larger shortfalls in the first two fiscal years after the November state elections also are effectively restored to their earlier projected levels, or worse, meaning lawmakers must solve at least $3.6 billion in red ink in first two years after the election. A much smaller problem also exists this fiscal year, with declining general fund revenues opening up a hole of just under $30 million. This represents only one-fifth of 1 percent of this year’s general fund. Minority Republicans in the House and Senate opposed the December deficit-mitigation plan, arguing it failed to cut deeply enough into overtime and other labor costs and other expenses that would have reduced the post-election deficits significantly. “We are most likely worse off now than we were a month ago when we ‘theoretically” cut $350 million from the budget,” House Minority Leader Themis Klarides, R-Derby, said Friday evening. Gov. 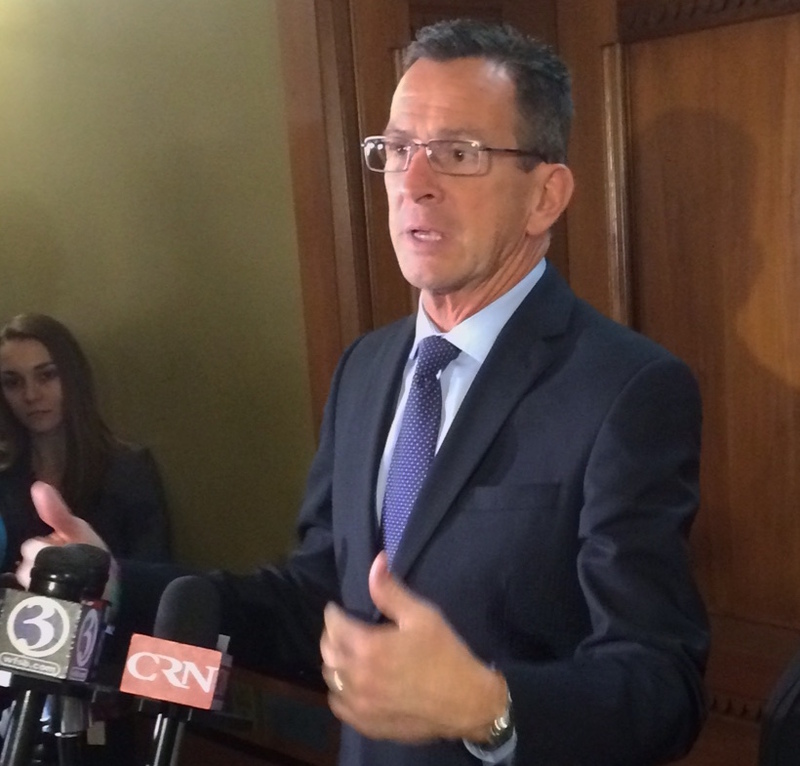 Dannel P. Malloy after deficit talks with legislative leaders ended in December. The projections released today only further underscore how perilous our state’s finances are, she said, predicting that without long-term adjustments to spending, Connecticut will continue to lose population. Klarides also noted the news comes in the same week that Connecticut learned one of its largest corporations, GE, would move its global headquarters out of the state, shifting it from Fairfield to Boston. The roughly $500 million deficit for 2016-17 that legislators and Malloy must solve in the upcoming session also exceeds the state’s emergency reserve — commonly known as the Rainy Day Fund — which holds about $406 million. And Fasano said he fears Democratic legislators will empty that reserve now to minimize the tough budget choices they must face before Election Day. Democratic legislative leaders did not immediately respond to the new revenue projections Friday evening.